Definition: The relay is the device that open or closes the contacts to cause the operation of the other electric control. It detects the intolerable or undesirable condition with an assigned area and gives the commands to the circuit breaker to disconnect the affected area. Thus protects the system from damage. It works on the principle of an electromagnetic attraction. 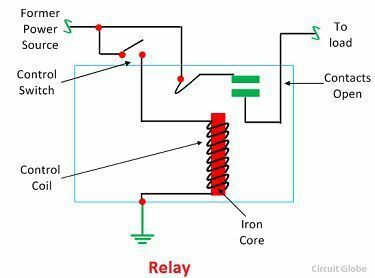 When the circuit of the relay senses the fault current, it energises the electromagnetic field which produces the temporary magnetic field. This magnetic field moves the relay armature for opening or closing the connections. The small power relay has only one contacts, and the high power relay has two contacts for opening the switch. The inner section of the relay is shown in the figure below. It has an iron core which is wound by a control coil. The power supply is given to the coil through the contacts of the load and the control switch. The current flows through the coil produces the magnetic field around it. Due to this magnetic field, the upper arm of the magnet attracts the lower arm. Hence close the circuit, which makes the current flow through the load. If the contact is already closed, then it moves oppositely and hence open the contacts. The pole and throws are the configurations of the relay, where the pole is the switch, and the throw is the number of connections. The single pole, the single throw is the simplest type of relay which has only one switch and only one possible connection. Similarly, the single pole double throw relay has a one switch and two possible connections. The relay operates both electrically and mechanically. It consists electromagnetic and sets of contacts which perform the operation of the switching. The construction of relay is mainly classified into four groups. They are the contacts, bearings, electromechanical design, terminations and housing. Contacts – The contacts are the most important part of the relay that affects the reliability. The good contact gives limited contact resistance and reduced contact wear. The selection of the contact material depends upon the several factors like nature of the current to be interrupted, the magnitude of the current to be interrupted, frequency and voltage of operation. Bearing – The bearing may be a single ball, multi-ball, pivot-ball and jewel bearing. The single ball bearing is used for high sensitivity and low friction. The multi-ball bearing provides low friction and greater resistance to shock. Electromechanical design – The electromechanical design includes the design of the magnetic circuit and the mechanical attachment of core, yoke and armature. The reluctance of the magnetic path is kept minimum for making the circuit more efficient. The electromagnet is made up of soft iron, and the coil current is usually restricted to 5A and the coil voltage to 220V. Terminations and Housing – The assembly of an armature with the magnet and the base is made with the help of spring. The spring is insulated from the armature by moulded blocks which provide dimensional stability. The fixed contacts are usually spot welded on the terminal link.